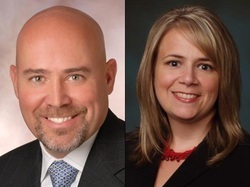 U.S. House candidates for NJ D3, (D) Aimee Belgard and (R)Tom Macarthur squared off in a debate last Friday night. They discussed issues such as attack ads leveled by Aimee Belgard, the Equal Pay for women, and the terrorist take over in Iraq and Syria. Belgard also criticized Macarthur's work as an insurance executive and Macarthur's criticized Belgard for her work as a trial attorney. Watch the full debate here! Take the Poll below! Unfortunately the candidates were only given 25 minutes to debate, so they weren't able to discuss other issues such as Obamacare, immigration, and only briefly on taxes and the economy. Equal pay - Aimee Belgard supports the Equal Pay Act for women claiming that it is needed because women only make 78% of what men make. Tom Macarthur responded by saying that we already have laws on the books that demand equal pay for the same work. ISIS in Iraq and Syria - Both candidates believe that Barack Obama has acted too slowly in responding to ISIS. MaCarthur also pointed out that Obama was wrong for not leaving a residual force in Iraq. Attack Ads - MaCarthur grilled Belgard for attack ads that he claimed were false. He pointed out that the ads were forced to be taken down and that they were considered to be untrue by factcheck.org. In spite of this, Aimee Belgard says the ads raise a good point called MacAarthur a natural disaster profiteer. Polls have been scarce to come by for this race. One poll had the race dead even at 42% and another had MacArthur with a 43 - 40 percent lead. Here is your chance to be heard. Please comment as well. Recently the Democratic campaign committee ran an ad on behalf of Aimee Belgard attacking Republican candidate Tom Macarthur. The ad shows destruction from Hurricane Sandy and states that Tom MacArthur walked away with 39 million dollars while he was was accused of cheating disaster victims. Tom Macarthur called the ads repulsive and Factcheck.org called the ads deceptive. The first problem with the ad is that the accusations have nothing to do with Hurricane Sandy. The accusations have to do Hurricane Ike in Texas and a California wildfire that occurred in 2008. Playing to the raw emotions that people feel regarding Hurricane Sandy and how wrong it would be to take advantage of Sandy sufferers has the Macarthur campaign very upset. The second problem is that the ad makes it sound like Tom MacArthur walked away with 39 million dollars while Hurricane Sandy victims suffered. Macarthur received 39 million when he agreed to sell his half of the company in 2005. He stayed on as chairman and CEO until 2010 when he left the company. Hurricane Sandy happened in 2011. Third, Tom MacArthur was the chairman and CEO of York Risk Services Group Inc. from 1999 to 2010. The ad describes MacArthur as an “insurance CEO,” but York is really a claims and risk management company that provides services, such as claims processing, for insurers and other companies. The lawsuit that came in 2010 named both York and Ace American Insurance. Fourth, the ad claims that MacArthur wants to deny people coverage and jack up rates. The ad is saying this while showing personal property damage from a hurricane. But they make this claim based on MacArthur's opposition to Obamacare. The majority of people are against Obamacare and the arguement suggests if you don't like Obamacare than you want to deny people health coverage and jack up rates. Aimee Belgard continues to stand by the ad saying he was the CEO and chairman of a company that was known for trying to deny claims to disaster victims. She also called him rich and out of touch. The MacArthur campaign struck back saying that she as spent her career as a trial lawyer specializing in defending companies and helping them deny claims to policy holders. What is going up next to Shoprite? Buffalo Wings, Panera Bread, and a Smashburger! I've been checking out the local blogs and it seems the majority of people are upset. Some about the traffic, some about the choice of business. Buffalo Wings seems like a fun place. Panera Bread's are pretty cool but there is an Atlanta Bread right across the street. Some people are upset about Buffalo Wings because there is one in Bricktown. I'll probably stay away from Smashburger. Does anyone know what is going on with that abandoned shopping center in Beachwood on Route 9, or 166, what ever it's called on that stretch. I'm just curious to know if there are any plans to do anything with that. It's been atleast partially abondoned for about 20 years now, and totally for maybe 10. 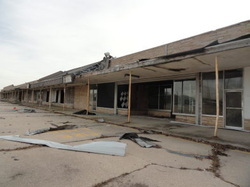 A developer backed off of plans to redevelop the land in 2012. Maybe there's a market for something a little more upscale like a Wholefoods or a Wegmans. If not they should just tear the think down already build a nice park. That would definitely benefit the community. It's even larger than it looks in this picture and a nice well kept park would really improve the value of the surrounding community. They don't need another run of the mill shopping center of the sort you see in this area. If they do that it probably will go out of business as fast as it goes up. Update: The last I heard was from an article in November 2013 that said they were in the process of pre-domolition The owner is facing over 2 million in fines for fire-code violations. It's 8 months later and this is the last I have heard and as of 3 days ago the structure is still standing. spent 2 million dollars of his own money against Lonegan who was a formidable candidate helping him defeat Lonegan by an impressive 60 - 40 margin. He will run against Aimee Belgard a freeholder from Burlington County. I don't know how much money she has or if she is condidered a strong candidate. 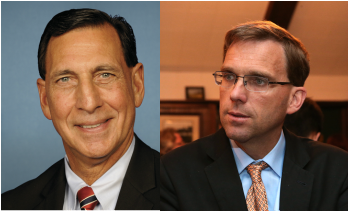 Incumbent Republican Frank Lobiondo will face off against Democrat Bill Hughes Junior in the 2nd NJ district. President Obama won the second district by 8.9% making it a democrat leaning district by 5%. In addition to that his father defeated Lobiondo in 1992 but Lobiondo was able to win in 1994 when Bill Hughes Sr. retired. So given his family history he should be strong candidate, particularly in this Democrat leaning district. Real Clear Politics lists this race as likely GOP. I am not sure I would agree with that assesment. I would say it's a toss up for now. Update: I have discovered that this district was pro Republican not long ago. In fact when Bill Hughes father defeated Lobiondo it was more Republican than the nation as a whole by about 4 points. Seaside Heights and Seaside Park will rebuild the boardwalk connecting the Sawmill and the Beachcomber. There will also be temporary amusements put up in the area. The question that many people would like to have answered is what are going to be the permanant structures along side the board walk.“We now have a blank slate...There’s the opportunity to go in a little different direction,” Mayer Bill Akers of Seaside Heights". Akers said that the permanant rebuilding wouldn't be done for another 2 or 3 years. I am not sure what he means by "a little different direction", but it would be nice if they built something more modern looking with nicer shops or eating establishments. The Seaside Park mayor says it will be at least a couple of years before the rides are back and Funtwon Pier Amusements is presenting designs to the Seaside planning board. How do you think Seaside should be rebuilt? Please do Not use Ad blocker. There are no pop-ups on this site.